Wellness experts love to warn against all of the sugar and syrups and calorie-packed creamers added to coffee. So you may be surprised by one ingredient some are now getting behind: butter. The concept was popularized by Bulletproof Executive founder Dave Asprey, and it took off among Paleo eaters. Integrative physicians like Jeffrey Gladd, MD, now tout its benefits, and healthy celebs like New York chef Seamus Mullen swear by it. “It’s rich and creamy and tastes delicious and gives you tremendous energy for quite a long time. I’ll go pretty much all day on it,” Mullen says. Curious about learning more? 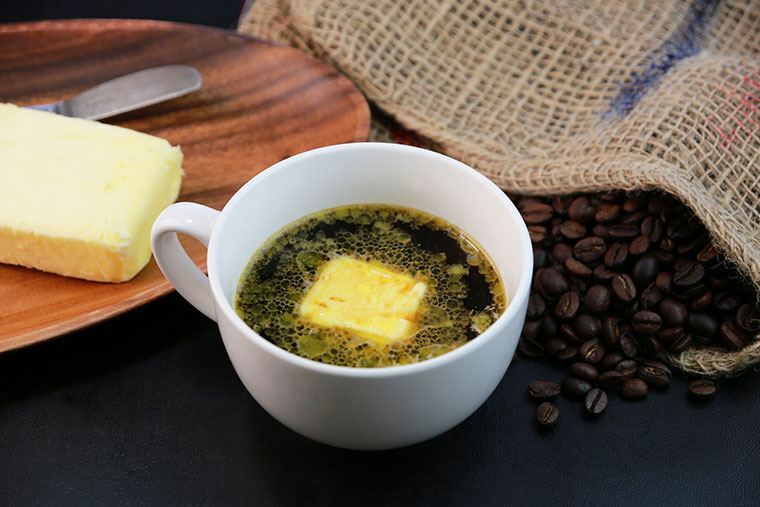 Scroll down to find out if buttery coffee is worth the hype. It’s not just about the butter. Asprey was initially inspired by yak butter tea, a traditional Tibetan drink, and he set out to create an optimized version. His recipe includes his own “upgraded” coffee beans harvested to reduce the occurrence of mycotoxins (that’s another very long story), unsalted grass-fed butter like Kerrygold (or ghee), and MCT oil, which is extracted from coconut oil to isolate the fatty acids, called medium chain triglycerides. You blend it all together (hello, Nutribullet) into a frothy, latte-like consistency. Tons of Bulletproof-style variations now exist. Many people use their own coffee or coconut oil instead of MCT, since it’s easier to find and much cheaper. Gwyneth Paltrow chef Ariane Resnick doesn’t drink coffee, so she adds the oil and butter to her morning smoothie. Those who drink it in lieu of a traditional breakfast (yes, it counts as a meal) tend to report serious improvements in energy, focus, and satiety. “When I’ve made it [the drink] with the MCT oil, it was like a kick in the pants in terms of energy,” says the health coach-founder of Stupid Easy Paleo, Stephanie Gaudreau, who usually makes hers with coconut oil. “It’s like rocket fuel!” Dr. Gladd has said it gets him through to lunch without hunger pangs and keeps him focused and sharp at work. So why does buttery coffee make people feel good while they’re sipping it—and long after? Despite butter’s bad-boy reputation in years past, the high-quality grass-fed variety (not Land ‘O Lakes) is now seen as a superfood by some nutritionists and functional physicians like Frank Lipman, MD. That’s due to its high concentration of CLA (conjugated linoleic acid), which has been shown to reduce belly fat, enhance weight loss, and boost heart health. And there’s now also research showing that some saturated fats may be (gasp!) good for you. MCT (or coconut) oil, also high in saturated fat, has been linked in small studies to fat-burning, enhanced brain health, and more. “Drinking Bulletproof-style coffee is a great stepping stone to get people to be a little more receptive to healthy saturated fat,” Gaudreau says. But, she cautions, if you’re not eating a low-carb, Paleo-style diet and are packing in carbs and sugar to begin with, your body may store the fat instead of using it for energy. “This can add a lot of high-fat calories, if the rest of your day doesn’t consist of clean eating,” she says. In other words, maybe don’t pair your butter-coffee with a stack of pancakes. If you’re curious if a regular ol’ cup of joe is good for you, here’s the complete low-down on how coffee affects the body. Oh and in case you haven’t heard, wine-infused brew now exists.